There's been something irking me lately. It's been lying under the surface for a long time, but two recent events made my stomach start to really knot. The most recent podcast episode of The Longest Shortest Time addressed the judgement that new mothers (and fathers) can throw at each other. The interview was with Kate Bowman-Johnston, who was asked to brag about something she was proud of as a parent. Her response was that she was able to breastfeed both her son and daughter, though there were challenges with her son, she eventually fought through and breastfed. While that is awesome for Kate, there was something she said that got under my skin...she stated that she was so anti-bottle formula feeding that she was afraid of the judgement of others, and felt like she wasn't being the best mom she could be by feeding her son formula. As I was driving and listening to this, my mind drifted back to day 2 of being a parent, sitting on the couch in my living room, feeding my son his first bottle, and just being so overwhelmingly happy that my son, whom had lost 6 ounces of weight in 24 hours, was eating something, anything. A few days later, The Food Babe posted an article about finding organic formula for babies, and in her Facebook post, she ended by saying, "(And obviously breast milk is best, but some mothers need an alternative!")." Something about that really got to me. I commented on her post that while I actually loved and valued her article, research and findings, I was upset that she had to end her post with that comment. Here's the thing: I've talked a lot about how new parents need to be lifted up, emotionally, and how we, as a culture, need to get the word "normal" out of our vocabulary. But, there's another word I have an issue with here: "best." Let me be clear: yes, we know 100% that breast milk is the best option, nutritionally, for babies. That's not a secret. I know that, you know that. Every doctor beats us over the head with that information. For some mothers, they need that snuggle and feeding time to bond with their baby, they need to feel that they are feeding their baby in the best way that they can. However, I think it's starting to become detrimental to tell new, scared, worried mothers that "breast is best!" when maybe...they can't do their "best," and provide the breast. By telling mothers that the breast is the best, and therefore, anything besides the breast is, well...not the best, it's simply telling mothers that they aren't providing the best environment, nutrition, and life for their baby. And, what new mom wants to hear that? By shouting the "best" word from the rooftops, it's sidelining every woman who can't, or (gasp) doesn't want to breastfeed. Furthermore, in my situation, the breast was not the best. Sure, do I, the paleo cook, wish that I could have given my baby my milk, instead of a factory-produced milk product? Nutritionally, sure. However, there's a lot more to being a mother than providing my baby with nutrition; there's that whole...mental, emotional aspect too. I knew that by breastfeeding, I would not have been a happy mother. I would have been stressed out, upset, frustrated, and resentful. 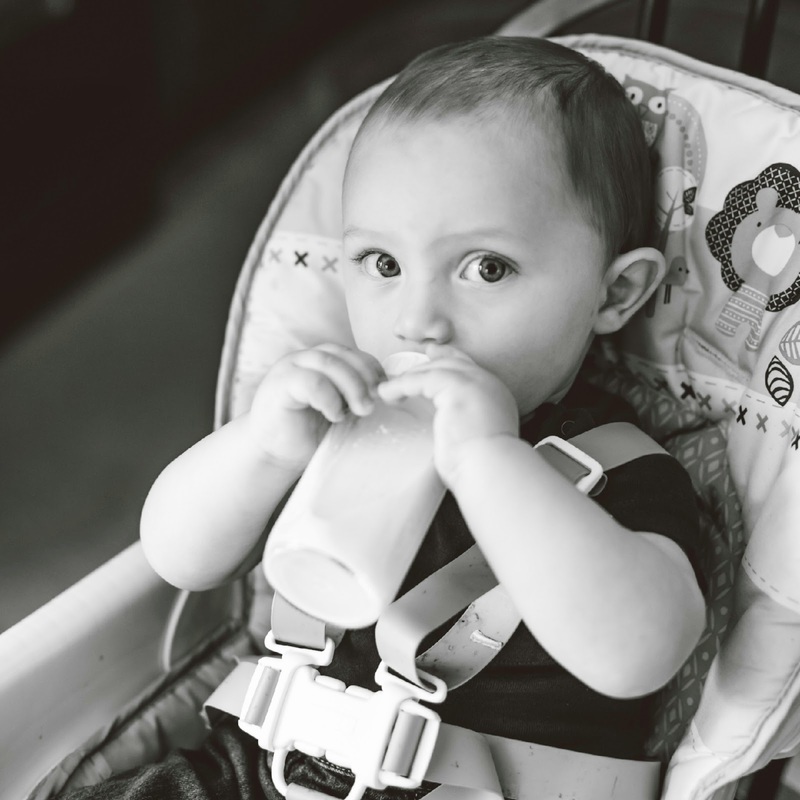 Do you know how many times I've formula-bottle fed my son and felt those feelings? Zero. Simply put, there is more to mothering than the fact that we have breasts. It was really hurtful to me, to hear that interview with Kate on the TLST, because she was clearly saying that if a mother chose, or had to, formula feed, she wasn't being a great mother. She wasn't doing her best. She wasn't choosing the best for her child. Just like with anything, you can't judge a mother for feeding her baby formula because you don't know why she is feeding her baby formula. We are all doing our best as new parents. My best was formula feeding, and I feel awesome about that. Like I said, I never felt guilty for formula feeding, I felt guilty for not speaking up sooner about not wanting to breastfeed. I think the "breast is best" phrase needs to be taken out of our lexicon; anything with "best" should. Take any topic about parenting: vaccines, germs, homeschooling, private schooling, playing with toy weapons...and you're going to have two sides to the argument. Someone will always say one side is "best" and one side is not. We are well aware, as a society, that breast milk is the best nutritional option for a baby; but, breastfeeding is not always the best option. We need to stop saying that formula is an alternative, because it's not: it's an option. It's an option that some parents choose, and others don't. It's an available option, just as breastfeeding is an option. New mothers are supposed to lift each other up, help each other out--not judge each other. It's so hard being a new parent, so let's stop judging, and start praising. Tell a new mom, "I'm proud of you!" or "You're doing great!" because sometimes that's all we need to hear to reassure ourselves that we're doing the best we can. Thank you for writing this Olivia. I am not a mother yet, but I come from a family of women that chooses not to breastfeed. I wasn't breastfed, my sister wasn't breastfed, and neither were our parents, aunts, or uncles. Based on a lot of what I hear and read, you'd think that there must be something terribly wrong with all of us or it's a small miracle that we turned out as well as we did because our mothers chose to give us bottles full of formula. I will not be breastfeeding my future children. I hope that other women respect the option I choose. I love this post because you helped me put myself in your shoes. Suddenly "best" does seem terribly hurtful. What a great post! I'm breastfeeding but it's definitely been challenging and there have been days when I think a bottle of formula would be so much eaiser. But I'm so traumatized by the whole breast is best thing that in paranoid to give up. But I know tons of moms that do formula and their babies are great! It should definitely be an option not alternative. Great post. I was so down on myself because I had very little success breastfeeding my first child. My son wasn't latching on and he wasn't getting enough when he did latch on. I tried all sorts of little odds that could of or should of made me more successful but nothing worked very well. We were both up all night crying, him most likely because he was hungry and me because I was exhausted and felt like I was failing as a mother. In the hospital the lactation consultant came in twice and seemed very concerned. Posters stating breast is best were plastered every where. I had never considered breastfeeding might not work and no one made me feel like it was okay if it didn't When I finally gave up 4 months later it was so liberating and I swore I would never make any mother feel lesser for the choices she made. Thanks for writing this! I had a baby last summer and breastfed til 8 months or so. The persistent online discussion about this topic drives me up a wall. Here's the thing. I'd like to take what you're saying one step further and say it's OK to choose not to do the ultimate best for your baby all the time. Because your BABY IS GOING TO BE FINE. Sometimes putting our own needs ahead of babies' needs is the best thing we can do. And our own needs might be any number of things that are really no one's business. I just don't get why there are so many activists about this topic; if you have an MD or a PhD in public health, you have every reason to go out and tell mom's what's best. But everyone else, can we please stop? I agree and I believe we as a society do this in many many areas. I'm tired of words like "normal" & "best" as well. This is a very healthy stand point - thanks for sharing.